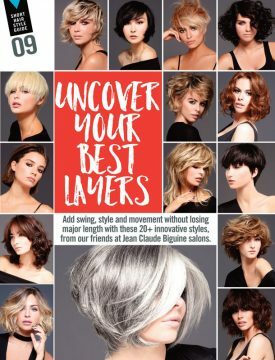 Add swing, style and movement without losing major length with these 20+ innovative styles, from our friends at Jean Claude Biguine salons. Lots of side volume and jet black locks (a nod to the goth trend, alive again) are oh-so edgy. 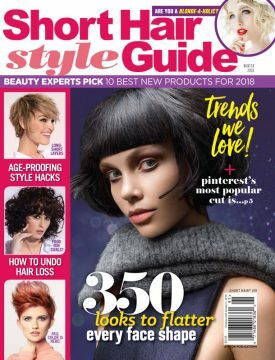 This cut is tailor-made for girls with naturally wavy hair. Simply wash, scrunch and go! Opt for asymmetry with layers that are longer on one side. In back, short vertical layers increase interest. Give shoulder-length locks a shaggy vibe by pairing a full crown with pieced-out ends. Best for thick hair with a hint of wave, this snip features stacked layers in back, tapered ends and curtain bangs. Chin-length layers frame the face, and angled ends form a playful flip. An elfin crop shows off pointy sideburns and choppy bangs that put the face into full focus. Platinum blonde layers are infused with volume and texture for a modern Marilyn Monroe vibe. This short bowl-inspired cut has pointy, temple-hugging sides and is snipped over the ears, leading to a v-shaped nape. Go big or go home by having your thick hair cut into allover textured layers. For a polished feel, try a pixie with long, peek-a-boo bangs, tapered sides and volume through the crown. Asymmetry fringe not only accentuates the eyes but it also adds softness, which can help you look younger. 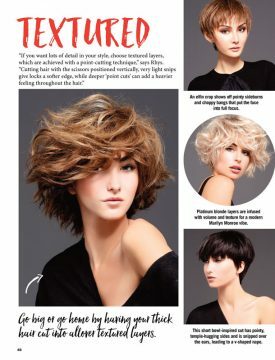 Here, straight, fine hair is razor-tapered all around, with light interior layers creating a bold bowl shape. Blow hair out to play up the cut’s linear lines and sharp edges. 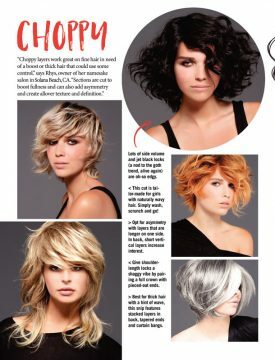 Add interest to a thick, layered bob with a mix of honey and golden blonde highlights set against dark roots. Rock bold bangs and natural wave with heavy layers, then style hair with help from the fingers and a curl enhancer. Perfect for smooth strands, you can wear hair slick and tucked back or go loose with extra volume. Balayage highlights will play up your cut when done by a color pro. Soft, face-framing layers on straight, user-dark hair are so sophisticated. Be a bombshell in wavy, tousled layers that feature blonde-on-brown tones. 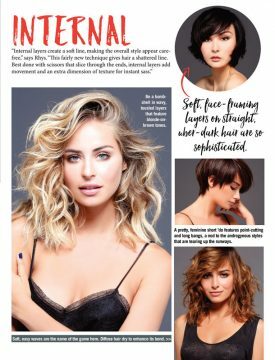 A pretty, feminine short ‘do features point-cutting and long bangs, a nod to the androgynous styles that are tearing up the runways. Soft, easy waves are the name of the game here. Diffuse hair dry to enhance its bend.